It was a thrill to see my "Orange Chair Silhouette on Aqua" print featured in the new Nancy Meyers film "It's Complicated". 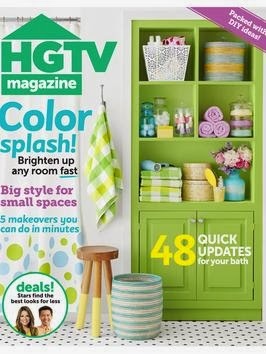 It appears in the INFAMOUS guest bathroom scene that took place at Lauren and Harley's cottage during the graduation party. Last March I received a message from someone identifying themselves as a set designer for an "untitled" Nancy Meyers film that was in production. They wanted to purchase 2 prints from my Etsy shop that had been specifically requested by Nancy Meyers herself and have them overnighted in time for Nancy's final walk through on the set before filming. Honestly, at first, I thought someone was trying to scam me! Turns out, after emailing back and forth, it was the REAL deal and I sent the prints off to Universal Studios in Brooklyn and they forwarded me the legal release forms to sign, etc. I have been a fan of Nancy's work for years and remember my borderline obsessive study of the interiors in "Father of the Bride" back in the 90's when I was still a teenager. The fact that she would request any of my work for one of her films was a real honor, to say the least. I was excited, but know from past experience how these things can go, so didn't really think my print(s) would make it into the actual final cut. After 9 months and having almost forgotten about it, I was contacted a week or so ago by a lifestyle editor friend in Washington DC who didn't know anything about me sending in my prints. She had seen the film and thought she recognized my work on the set. This email was followed by several others from various people and so I thought it was time I should see for myself. 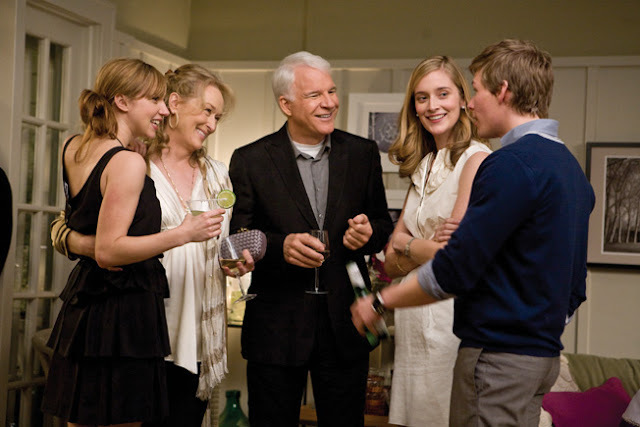 Sure enough, it did end up in the second half of the movie in the infamous bathroom scene involving, ahem, some reefers and a few people stuffed into a very small space (it appears directly behind Meryl Streep in the scene). This is one instance where giving someone the benefit of the doubt and cooperating certainly paid off in a big way! I want to thank Nancy and her production team for including my work as a tiny part of one of her signature "beyond fabulous" sets. You can buy the exact same print here. I'd like to wish you a safe, joy-filled, prosperous and HAPPY NEW YEAR!!!! I want to wish everyone a very Merry Christmas! This time of year, I am reminded of all of the blessings in my life and, for me, the Greatest Gift that was ever given, Jesus. I'd also like to include my very best wishes for those of you who celebrate Hanukkah, Kwanza or something else entirely. I am grateful for all of you readers who take the time to visit this blog throughout the year and leave your supportive comments. I am taking a few days off to celebrate with my family and friends, but I look forward to seeing you in the New Year and wish you and yours all the best!! 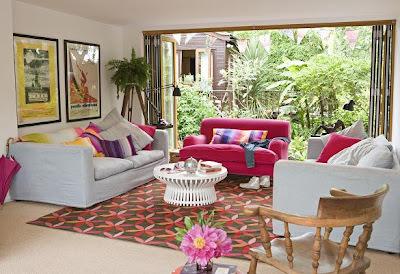 I am loving this colorful houseboat on the Thames River that I saw a photo tour of here. It belongs to author Josie Curran and revolutionizes the concept of the dreary, damp, spider-laden houseboat. Lots of fun. Thanks to Shannon for including me in his gracious post recently. Also talented stationer Amanda at Tart Paperie. and Sarah at Flourish Design in Calgary. So kind! If I am missing anyone who has posted on my work recently, please let me know. I cannot believe it's only a week until Christmas - it's been a whirlwind here wrapping up everything to get shipped to my wonderful clients and customers. Thanks to everyone for making this such a great year. Have a terrific weekend and I'll see you back here on Monday! 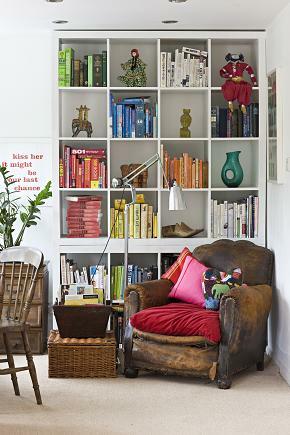 How does this look for a cozy place to break from the Holiday busy-ness with a mid-morning cup of tea? 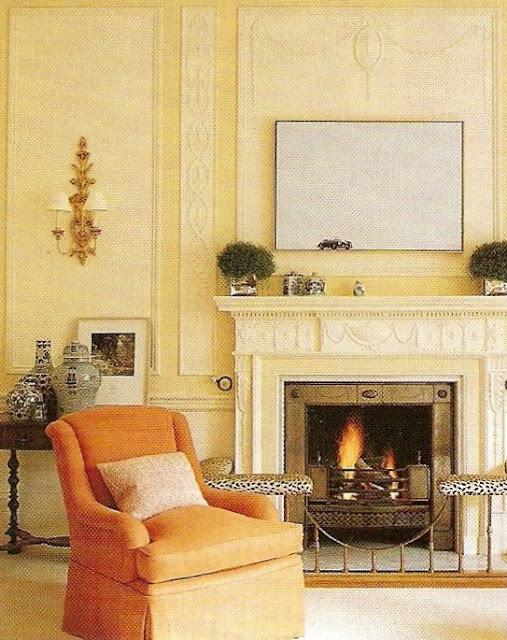 I don't remember what publication I tore this out from (bad blogger form) but I LOVE IT~ I believe it's in a London townhouse, if memory serves me correctly. I have fond memories of reading the "Paddington" series of books as a kid and especially loved the idea of Paddington taking his "elevenses" or mid-morning tea and snack with antique dealer and friend Mr. Gruber. This looks like as good a place as any for elevenses, don't you think? My Grandfather was never without his Polaroid camera during the holidays. I cherish the distinctive white-bordered photos that I have from him that were taken in my childhood. 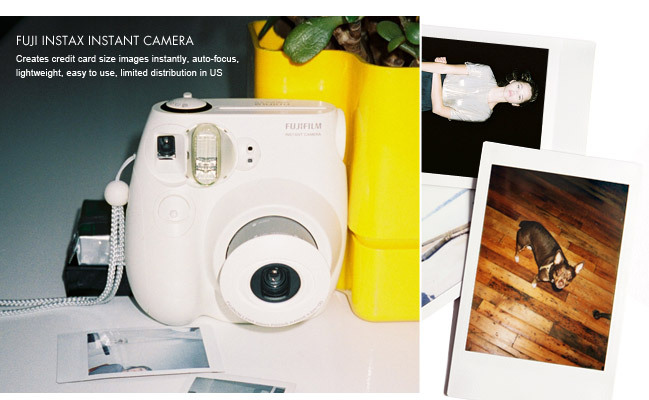 For all of you who have been mourning the end of the Polaroid, here's a new option that's a pretty cool way to capture your favorite images. It's available here. 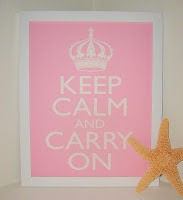 I'd like to say thank you this week for the following posts/mentions: The lovely and talented writer, Kwana, and her mention of my "Keep Calm and Carry On" poster. 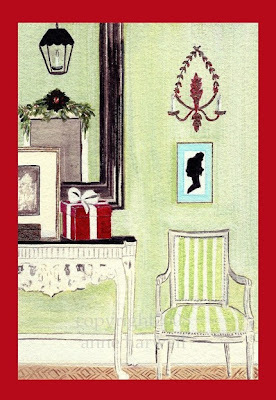 reknowned American-now-living in-Australia designer Diane Bergeron included my new "Merry Christmas" cards in her post on Holiday Greetings. 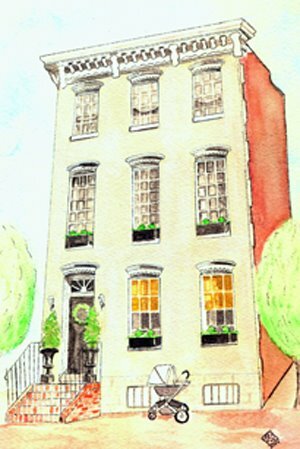 and, once again, Beth Connelly of Chinoiserie Chic and her post on meeting famed designer Alessandra Branca at a Georgetown home that I was commissioned to paint earlier this year. Thanks to everyone for the support! I apologize for the lighter posts lately as I am struggling to get promised commissions out to my clients before the Holidays. I hope you all have an excellent weekend. 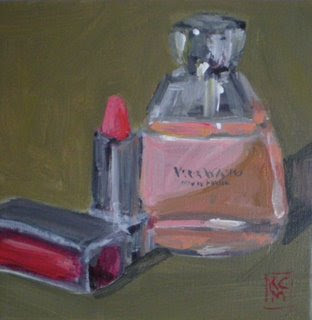 "Evening" by Liza Hirst - buy it or any of her other amazing pieces on her new site. **UPDATE** Liza has generously offered all Annechovie readers a special discount! 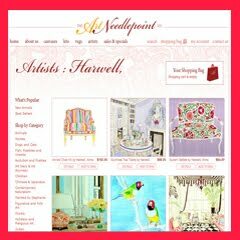 Just enter LIZA2009CH at checkout on her new site here. 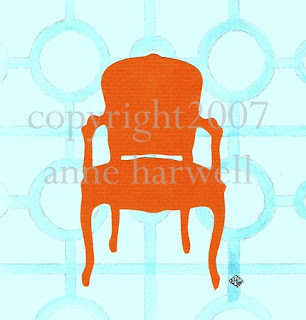 Brand new release today, "Courtney's Chair II". 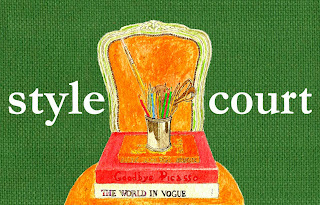 This gouache/ink painting was originally commissioned by reknowned Style Court blogger Courtney Barnes and is featured in her new blog banner designed by me. It's available now in my shop in an 8x10 giclee print (11x14 also available by special request - convo me for details). 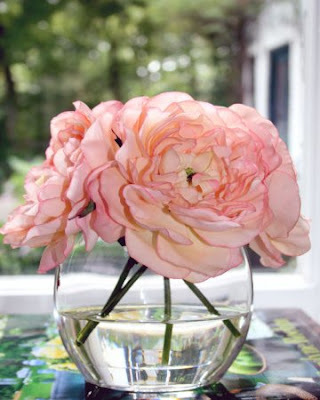 A great way to wrap up this busy week is to thank some of my internet friends for the blog-love. Thanks to the vivacious and gracious Valorie over at Visual Vamp for including me in her list of blogger-shopowners and holiday finds. I'd also like to thank London-based blogger Marina of Iced Vovo's for her kind post as well! And last, but certainly not least, the ever-stylish, double-blogging Beth of Chinoiserie Chic. Thanks so much to all of you! You guys are the best! Thanks also to all you wonderful and loyal readers who keep me motivated - have a STUPENDOUS weekend!! I was delighted a couple of months ago when fellow blogger and talented artist Susan Schneider approached me about collaborating together on some projects for the Holidays. Susan is always turning out uniquely beautiful pieces from her quaint shop and workshop, Shandell's, in Millerton, NY. 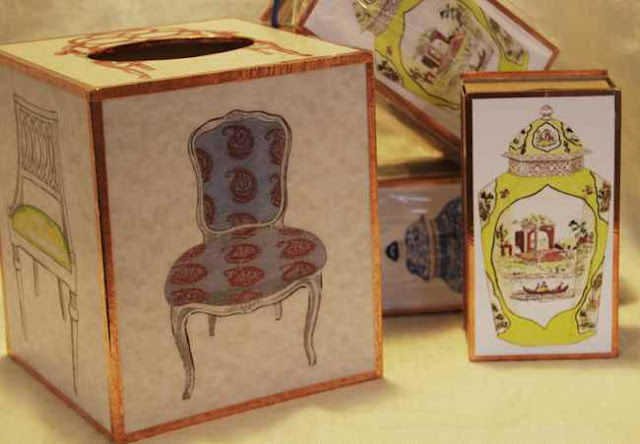 She has incorporated 5 of my chair designs into a beautiful tissue box cover and has also taken 2 of my chinoiserie vase images to use on matchboxes. These limited edition pieces are available now in her shop, both online and in Millerton, NY. Go here to check them out! 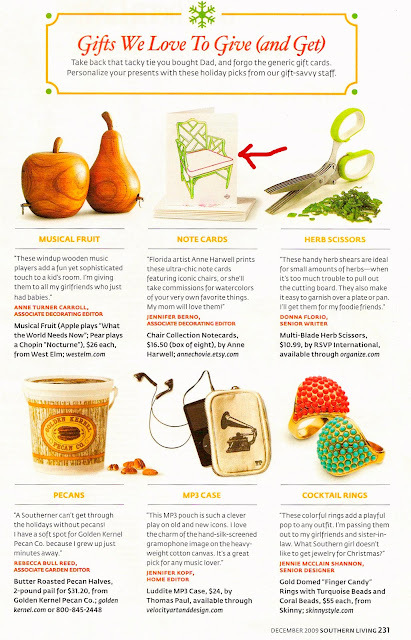 I would like to extend a sincere and hearty thank-you to Jennifer Berno and all of the editors at Southern Living magazine for featuring my note cards in their "Editor's Picks" section of the December issue. I certainly appreciate the mention! I hope that everyone had a great weekend! I had a wonderful time celebrating Thanksgiving with family and loved ones. After a little break, I am all revved up and ready for the start of the Holiday Season!! 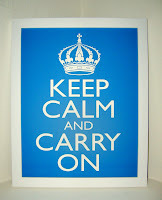 I am offering a special today on all of my quote prints - including the new "Keep Calm and Carry On" prints. All quote prints are 40% off the regular price - marked down from $25 to $15 a piece. The offer ends tonight at midnight EST, so don't let the opportunity pass you by! These make great gifts, so why don't you click this link and check out the selection for yourself? I've had some catching up to do with thanks for some very nice mentions recently. Here in the States, it's an especially fitting time as we celebrate Thanksgiving this week. 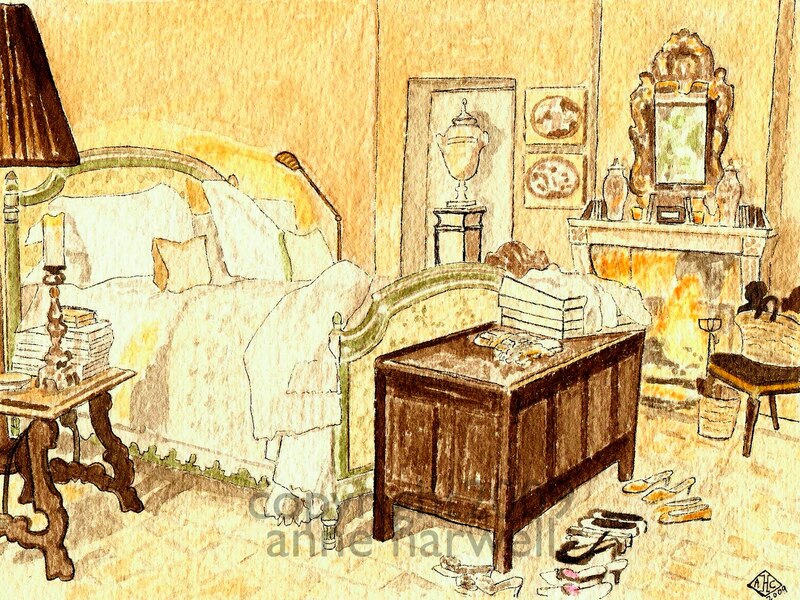 First off, I'd like to thank the lovely Vicki Archer for posting my painting of her charming guest bedroom on her blog French Essence. 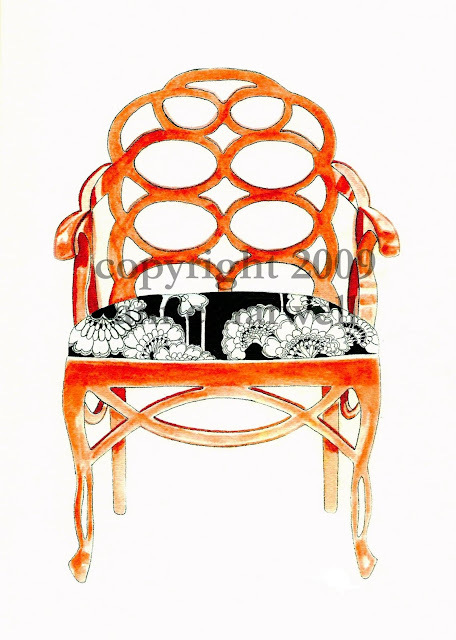 Vicki's take on elegant living in France is always a treat! I also would like to thank Barbara Mangini for her kind mention on My Dog-Eared Pages as well. Then there's the talented writer Kate Coveny-Hood and her mention on Wishing True and also Skyla over at stellar design blog Sanity Fair. 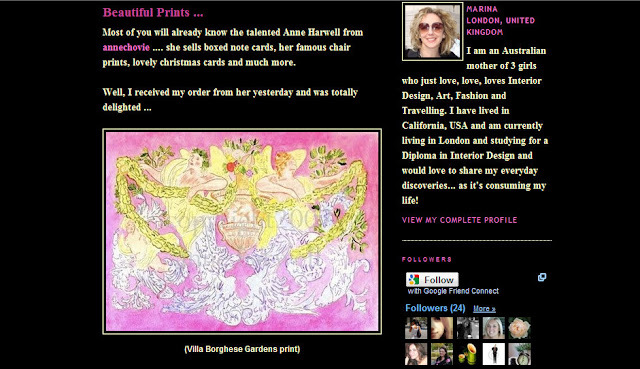 Last, but certainly not least, my Aussie friend and fellow blogger, Anna Spiro and her post on my Christmas Cards last week. I am so blessed to be a part of a truly great design blog community that is so supportive of one another. I want to wish everyone a very Happy Thanksgiving and for all those of you abroad who don't celebrate Thanksgiving, have a lovely end to your week! I will see you next Monday after the Holiday! I want to thank my talented and gracious friend Kate Coveny-Hood over at Big Piece of Cake for her very kind post on my work and the Holiday give-away I am sponsoring on her blogs. 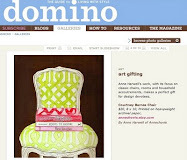 If you don't read Kate's blog(s) yet, be sure to stop by and enter. She will be running a series of great give-aways throughout the Holidays - don't miss it! NEW MUG DESIGNS AND SALE ON NOW!! All of my mugs are on sale now, including this and other brand-new designs! Check them all out here AND HAVE A TERRIFIC WEEKEND! Hmm, does harnessing a pet's excess energy to shred documents infringe on pet labor laws? This is an instance where political correctness could get very messy. 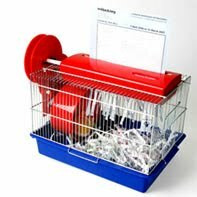 Is it saving electricity, going green and giving your hamster exercise OR is it exploiting rodents? What say ye? I thought it was pretty clever, actually. I hope you're having a good week! Meet Reesie, one of my recent subjects captured here in gouache and ink and commissioned as a birthday gift for a client's mother-in-law. 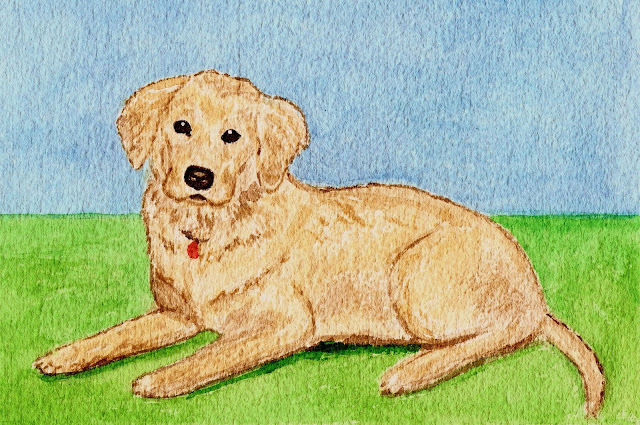 Pet portraits make a wonderful gift for birthdays and holidays. Contact me here for details - let's work together. 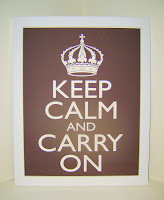 After numerous requests, I finally decided to create my own version of the "Keep Calm and Carry On" poster popular in England during World War II. 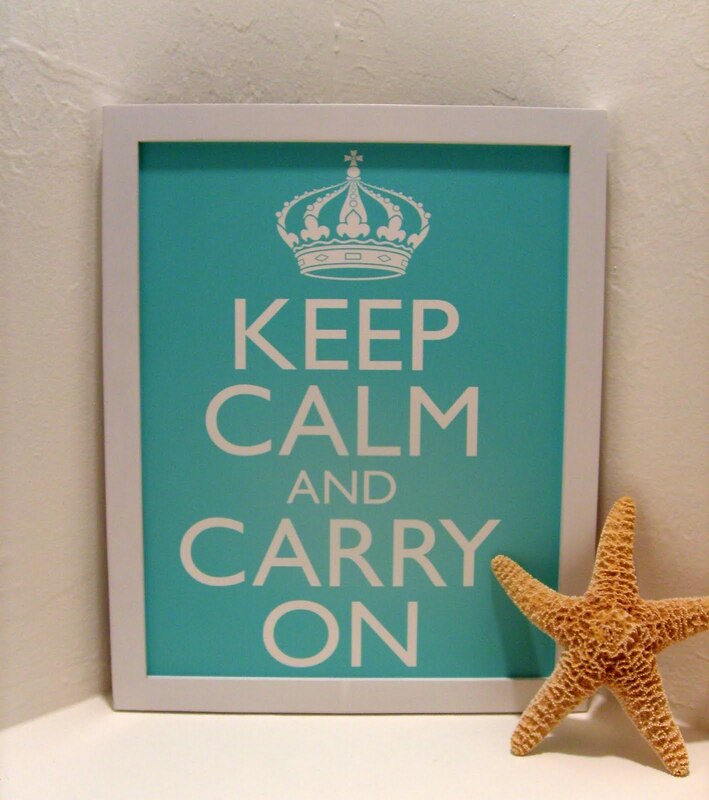 It's available in my Etsy shop in aqua, chocolate, pink and china blue. I am also able to create custom colors, so feel free to convo me if you're interested. 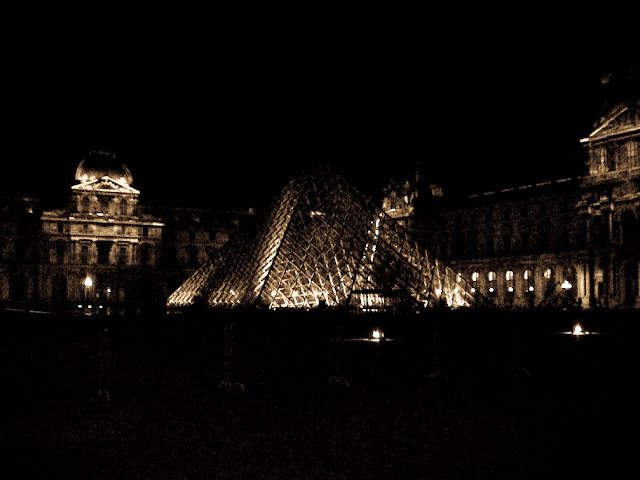 I was looking through my files and came across this photo of the Louvre by my brother Josh. It brings back some magical memories of walking through Paris at night with both he and my sister a few years back. I was the one who insisted on the three of us walking several miles back to the hotel....they have never let me forget it, as my sister needed to find a restroom and it took us much longer than I had projected. LOL. Good times and priceless memories - the photos that resulted aren't too bad either, as my brother is very talented. Do you have any travel photos that bring back a flood of memories for you? I hope that everyone had a good weekend! It's a new week and I am introducing a new version of my Elkins Chair - it's now available upholstered in a black and white floral fabric. Available here in my Etsy shop. 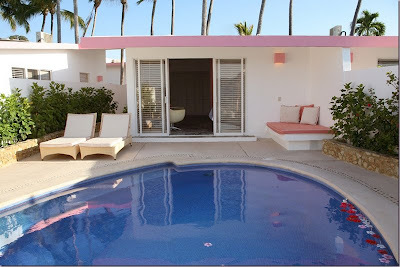 After a very busy week, this looks like a great place to spend a little time relaxing, doesn't it? I hope you all have a terrific weekend and I look forward to seeing you on Monday! If you haven't seen this already, you may want to check it out. The Sundance Channel is featuring a program that follows Anthropologie buyer Keith Johnson as he traipses all over finding treasures for the stores. Watch a clip of "Man Shops Globe" above. Kelley MacDonald is a talented painter based in Tiverton, Rhode Island. 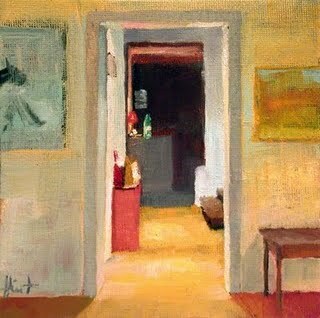 I first caught sight of her pretty landscapes and colorful still lives as I was perusing the Daily Painters Website. As you all know, I am drawn like a magnet to COLOR and Kelley's brand of eye candy drew me in. 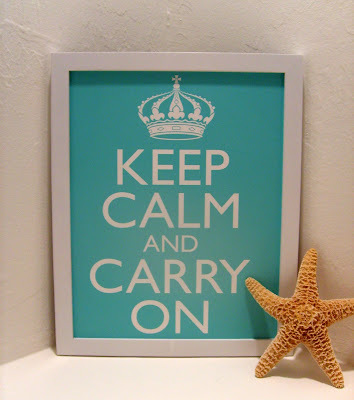 I was soon transported to the beautiful seaside in New England and found myself leaving a comment on her blog. She responded with a great deal of warmth and seems like a very spunky and upbeat sort of person, both pluses in my book! 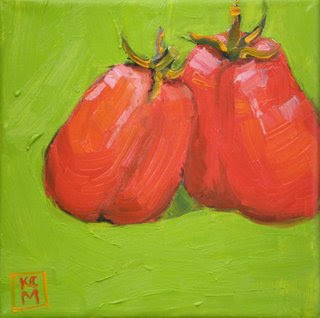 She has a keen knack for capturing scenes and objects in a very textural and colorful way. 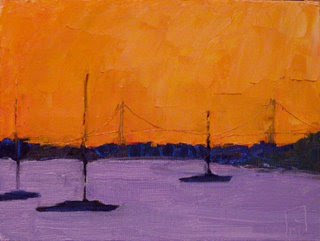 She often paints in and around Cape Cod. I thought she would be a person I would definitely like to learn more about, and she has kindly obliged me with answering some of my questions about herself and her unique gift. Where were you born? Falls River, MA, a tired old mill town in Southern Massachusetts. What is your artistic background/training? I was an Art History major at Wheaton College, in Norton, MA, then I've been taking classes pretty much continuously for 30 (gasp!) years. 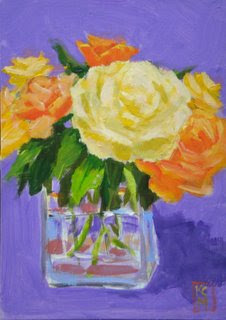 Lately I've been taking workshops with artists who have reached a certain level of success, and are nationally known. When did you first demonstrate artistic leanings? When I was about 4 years old my Nana and I used to sit on the front steps and wait for Papa to come home from work. 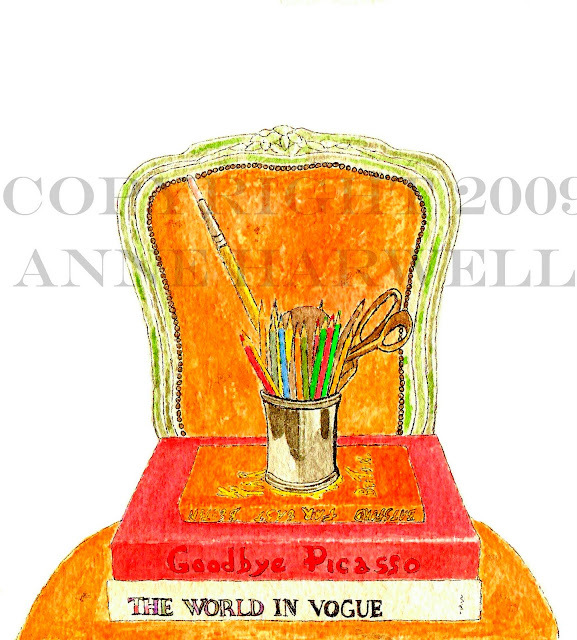 She'd always bring a clean fresh pad of white paper and super sharp pencils for each of us. She taught me to draw houses (triple deckers) and birds in the air. She'd laugh hysterically if she were still alive to read that this is what got me 'juiced up' to become an artist! But once the bug bit it never let go, and despite family and school discouragement ("Artists can't make a living... choose something PRACTICAL.") in my heart I was always an artist. 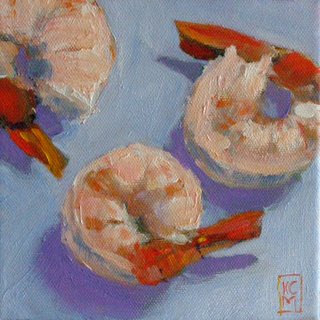 What subject matter seems to inspire you most? Does living on the Coast influence you a great deal? Landscape and skyscapes are what first drew me in. The one wonderful thing about growing up in Fall River was that it is situated on a huge hill facing west, and going to see the sunset at the park was common, and pretty spectacular on a daily basis. The more I learned about painting the more I 'saw' - such as the reflected light on clouds, and the further reflection of light on the water. And for the past 5 years I've lived right on the water and have a sunset view which is spectacular - it's such a hook - every day, every hour of the day, a different view. I've always been partial, spiritually, to where the water meets the land. It seems holy, but I don't mean it in any particularly 'religious' way. What about your family, tell us a bit about them? My husband and kids are very supportive. And my sister's support is important to me, too. They all turn out for Openings, and say really nice things about the work. Friends are super important, too, colleagues who are all pushing ahead with their art and willing to share. Fortunately for me, I have some really good ones! Do particular locations inspire you? Location is not supposed to matter, but it does to me, and sometimes just a change of location gives me a jump start on the creative process. Like I'll go to Mexico and the colors leave me breathless, and I cannot wait to dip brush into color and translate what I see into a painting. 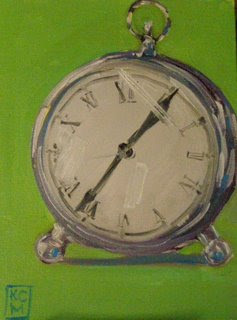 I love both US coasts, and Europe, too, and Sedona... All these places inspire me to put 'my take' on them onto a canvas. You recently spent a while in Europe, painting. Where would you live if you were free to live anywhere? Oh, this is killing me! OK. Paris :), or Petaluma, CA. ... or Laguna. ...Sedona, or... Wellfleet, MA, on Cape Cod... maybe NYC... OR..... right here where I am, in the Tiverton, RI area. Sorry... this changes minute by minute - I have a gypsy soul! What are the most challenging aspects of being an artists for you? 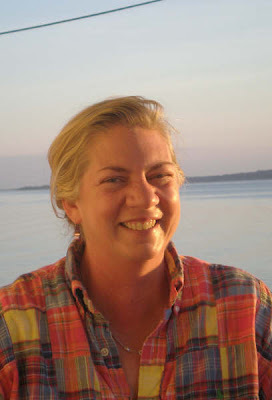 Thank you, Kelley, for sharing more on your life and work with us! Why don't you take this opportunity to check out one (or all!) of Kelley's sites?? Don't miss it! Verdigris Vie is hosting a Sophie Dahy Design give-away. The prize is your choice of a beautiful arrangement at a value of up to $300. Enter now through November 15th here! I started a holiday tradition last year of debuting at least one new set of Christmas cards a year. 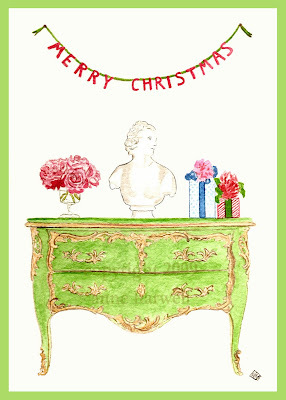 My new "Merry Christmas" cards are available now in my store. The new card features a classic French chest topped with a marble bust, rose bouquet and gift packages. Above it, an old-fashioned banner reads "Merry Christmas". They come blank inside, but custom printed messages are available for an additional fee. Contact me here for details. Also available is last year's design that remains a classic Annechovie favorite. Both are available here. I'd also like to thank my friend and fellow blogger, the ever-gracious Courtney Barnes for her mention and post last Friday.